It’s been nearly 20 years since the world of professional wrestling took a turn for the better or for the worse depending on how you look at it. World Championship Wrestling executive producer Eric Bischoff knew that his federation was sagging in the television ratings to the World Wrestling Federation and as he was looking to catch up to the WWF, little did he know what he was going to get. In 1996, World Wrestling Federation chairman Vince McMahon was in dire financial straits in wake of a steroid scandal that saw him in a fierce battle with the federal government. And as McMahon’s company was losing money, he couldn’t afford to pay all of his talent; especially those who had expiring contracts. Two men in particular that had expiring contracts in the spring of 1996 were Scott Hall and Kevin Nash. At this point, Hall was widely known to wrestling fans as Razor Ramon and Nash as Diesel which were their characters in the World Wrestling Federation that they had the most success with to that point. And as Nash along with Hall were looking for a pay raise that McMahon couldn’t give them, it was just the opening that Bischoff needed. A failed drug test on the part of Hall had put him off of World Wrestling Federation television in early 1996 until he made his last television appearance in late April, while Nash would make several television appearances which included him losing to the Undertaker and Wrestlemania 12. Bischoff was so desperate for better television ratings, that he would give Hall and Nash preferential contracts which included automatic bumps in pay if another wrestler would receive a contract that was more lucrative than theirs. Hall would appear on the May 27, 1996 edition of World Championship Wrestling’s Monday Night Nitro where he would appear out of the crowd to interrupt a match. Hall would show no allegiance to WCW as he just appeared to be an “outsider” that had been sent there by McMahon. These interruptions by Hall would go on for several weeks until he was finally confronted by Sting who was the face at the time the face of WCW. The following week would see Nash make his appearance on Nitro, and he was welcomed by the fans with chants of “Diesel, Diesel”. Together Hall and Nash would show outright disrespect for authority and World Championship Wrestling which made them cool with the younger demographic. Hall and Nash would continue to push the envelope which included the 7-footer Nash delivering a “power bomb” to Bischoff that June at the Great American Bash. The presence of Hall and Nash would see the WCW roster band together in spite of their personal feuds as it was no longer and good guy-bad guy affair, but more of an us against them mentality. The battle line was set for Bash At The Beach which would take place at the Ocean Center in Daytona Beach, Florida on July 7, 1996. That night’s main event would feature the “Macho Man” Randy Savage, Sting, and Lex Luger who were representing World Championship Wrestling against Hall and Nash who were now referred to as the Outsiders, along their “mystery partner”. A “kayfabe” injury in that match to Luger saw him taken from the ring which left Savage and Sting to face Hall and Nash. It was an intense match throughout until the waning stages when all four men were laying on the canvas which would pave the way for wrestling history. The crowd at the Ocean Center would erupt at the site of Hulk Hogan making his way down the isle donning his traditional yellow and red. Hogan rose to iconic status in the 1980’s as the ultimate good guy as he told children to train, say their prayers, and eat their vitamins as he worked for McMahon’s World Wrestling Federation. Hogan had appeared as a heel early in his wrestling career, but it was prior to wrestling being shown on a national stage. Hogan’s entrance to the ring would see both Hall and Nash exit the ring under the bottom rope which gave the impression that they wanted no parts of the Hulkster. Hogan would then proceed to do a pair of symbolic gestures; first he would rip off his t-shirt which proceeded something that people could not fathom. With Savage laying in the ring, Hogan would deliver his iconic leg drop on him as the world finally knew the identity of Hall and Nash’s mystery partner. There was an immediate hatred for Hogan as the fans littered the ring with debris which was something that had never been displayed on television towards him. Hogan would then give an interview in the ring with “Mean Gene” Okerlund which solidified his turn as a heel that featured venom and angst for the likes of Savage and Sting as Hogan would proclaim himself, Hall, and Nash as “the New World Order of professional wrestling”. And for anyone that believes professional wrestling to be “fake”, they didn’t understand the impact of what had just happened in Daytona Beach. A fan had to be restrained from getting into the ring that night to confront Hogan while Bischoff was receiving tons of phone calls and letters from angry parents now that Hogan was being portrayed as a heel. And when this happened, Bischoff knew that he had struck gold. The New World Order would help World Championship Wrestling win the television ratings against the World Wrestling Federation for 88 weeks, but their effect can still be seen on wrestling now. When the New World Order was formed, it sparked the birth of the “Attitude Era” in professional wrestling as wrestlers began to develop their characters based more around who they were, and it also forced McMahon to change his style. As McMahon and Bischoff battled, wrestlers began to shed “gimmicks” which had long been the norm in professional wrestling. 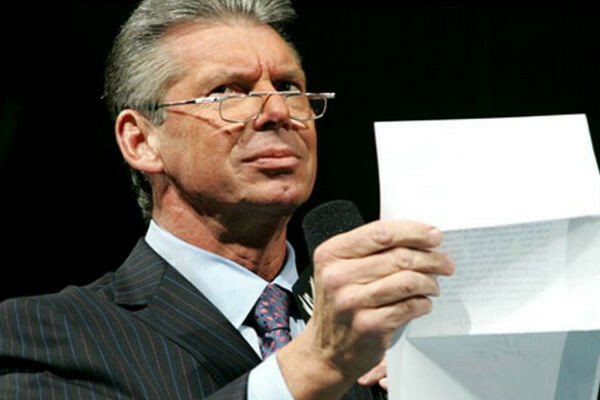 McMahon has always been a very smart businessman which included him trademarking the characters that he had a hand in molding which is why Hall, Nash, and others were going by their given names after leaving the WWF. 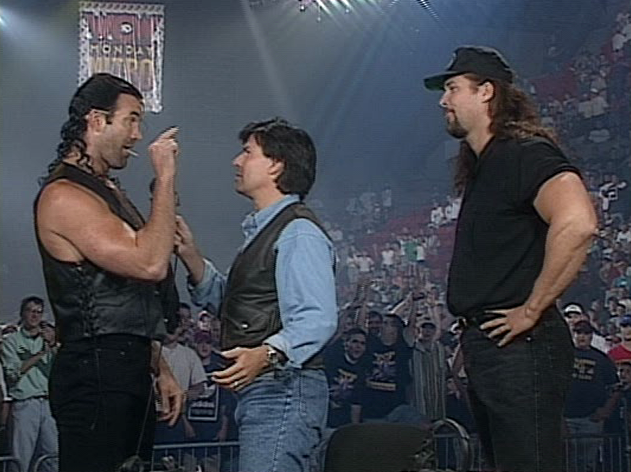 When Bischoff signed Hall and Nash, he also gave them guaranteed contracts which wasn’t done at the time as a wrestling contract between a promoter and wrestler in those days was primarily sealed with a gentlemen’s handshake. And nearly 20 years later, the guaranteed contract has become the norm. But all wasn’t well with Hall, Nash, and the New World Order which also led to the demise of Word Championship Wrestling. Unlike in the World Wrestling Federation, Hall, Nash, and Hogan had more freedom, along with more creative control of their respective characters. Hall’s suspension in the WWF was just the tip of the iceberg for what was to come in World Championship Wrestling as he would spiral out control with an addiction to alcohol that would see him bring a “red cup” to the ring from time-to-time during interviews along with appearing to be under the influence at other times. Hogan would flex his contractual muscles which included him changing story lines right before the start of Nitro. Nash would also begin to book matches which is always difficult on a wrestler as there is always going to be someone who is disappointed with you in the locker room; especially when you’re attempting to boost your character and bring down theirs. And just as the flash and over-inflated egos made the New World Order, it also destroyed it. The New World Order went from being solid nucleus of Hall, Nash, and Hogan in the summer of 1996, to a watered down version in a very short period of time as it appeared to be the outline for a battle royal every time that they hit the ring to cut a promo due to the amount of guys that came out with them. 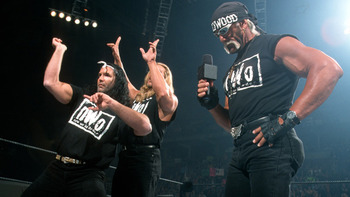 The NWO would then be split up in the Wolfpack which was led by Nash, and NWO Hollywood which was Hogan’s crew. The breaking point would come on the January 4, 1999 edition of Nitro where Hogan would challenge Nash for the World Championship Wrestling Heavyweight Title. It appeared to be a main event for a lifetime which included ring introductions by boxing ring announcer Michael Buffer. Hogan would come out to his now iconic theme of Jimi Hendrix’s “Voodoo Child” along with company of Scott Steiner while Nash would be walked down the aisle by Hall. 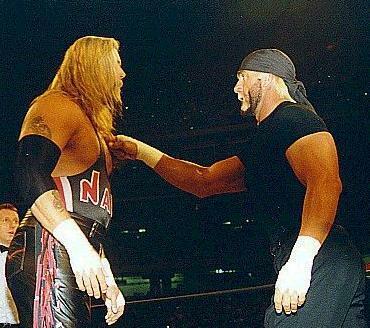 The nearly 40,000 people in attendance at the Georgia Dome that night were ready for a battle until in the early moments of the contest, Hogan delivered a finger poke to Nash’s chest which sent him to the canvas. Hogan would then cover him for the pin to once again become the World Championship Wrestling Heavyweight Champion which left the fans at the Georgia Dome irate. The “Finger Poke of Doom” would help to signal the beginning of the end for World Championship Wrestling. McMahon had recovered from the financial peril that he was in the few years prior to that and his company had plenty of steam with “Stone Cold” Steve Austin and the Rock leading the way. And with Bischoff contractually obligated to give Hall and Nash automatic pay raises if other wrestlers received more money than them, his hands were tied when it came time to re-negotiate contracts with the likes of Chris Jericho, Eddie Guerrero, and the Giant as each of these men would leave for McMahon’s World Wrestling Federation during 1999 and early 2000. By early 2001, World Championship Wrestling was losing nearly $5 million a month. And as the end appeared to be near for WCW, McMahon bought the company for roughly $5 million. McMahon mainly wanted WCW’s video library and he didn’t have a need for most of the talent. Wrestling fans still wanted to see the former stars of World Championship Wrestling appear on World Wrestling Federation television as the likes of Booker T had popped up on Monday Nigt Raw and Smackdown. But being that WCW was owned by AOL Time Warner prior to McMahon’s purchase of the company, wrestlers who were still under contract instead opted to stay at home and get paid instead of working for McMahon. But in late 2001, rumblings began to surface about McMahon bringing the New World Order to the World Wrestling Federation. And those rumors were confirmed in January 2002 with the image of the NWO appearing on WWF television. A raucous crowd would welcome the NWO to the WWF that February at No Way Out and over the next few months they would be greatly received wherever they would go. But unlike in World Championship Wrestling, the NWO wasn’t in control as McMahon was firmly running the show for the WWF. And after a series of events which included Hogan returning to his iconic yellow and red, along with the “plane ride from hell” which saw McMahon fire Hall, the NWO was disbanded later that year. Fans and wrestlers alike have been on the fence about the New World Order as you either loved them or hated them. By some wrestlers the NWO was criticized for not making enough stars which could be debated as wrestlers such as Marcus Bagwell and Konnan were mid-card guys who’s status changed once they joined the NWO. In 1997, the NWO would feud with Diamond Dallas Page which was the push that he needed to eventually become the World Championship Wrestling Heavyweight Champion. 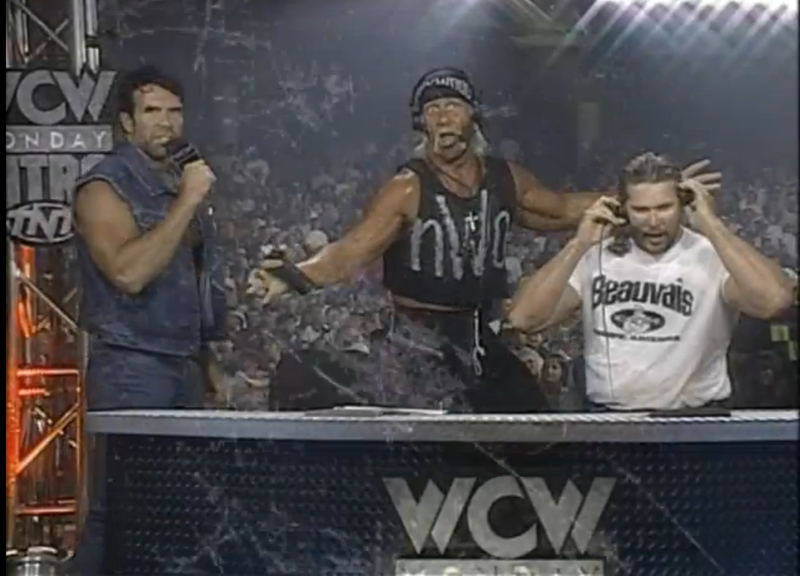 The arrival of the NWO in WCW meant the end of the days of the organization being considered “Southern wrestling” as they became more mainstream. The NWO’s appeal allowed Bischoff to sign Basketball Hall of Famer Dennis Rodman who would be Hogan’s tag-team partner at several pay-per-view events. The days of the Four Horseman who were led by Ric Flair and Arn Anderson running things in WCW were over as the NWO represented the new breed, and typically when someone is changing the game, they are meet with resentment. You can still see the impact of the New World Order on professional wrestling to this very day as the gimmick era may never appear again in professional wrestling while wrestlers themselves have become more business savvy. For wrestling fans at the time it didn’t seem like it, but the spring of 1996 would mark the dawn of a new day in professional wrestling with Hogan, Hall, and Nash leading the way.